CONWAY, S.C. – According to its latest update, the HUGO Hurricane Landfall Outlook Program at Coastal Carolina University is forecasting a slightly higher probability of Atlantic hurricane activity in 2016 than was indicated in its initial report, released in April. The update forecasts a marginal increase in the number of tropical storms and the number of hurricanes, as well as a slightly greater probability of a landfall on the U.S. East Coast. Read more about Hugo team at CCU releases June update of the hurricane outlook for 2016. Congratulations to the Spring 2016 Coastal Marine and Wetland Studies Graduates, Kathryn Altmon-Goff, Caitlyn Bozza, Yianni Laskaris, Jonathan Petrigac, Karsen Schottleutner and Daniela Silva. CMSS Faculty and Affiliated Faculty wish them all the best of luck! 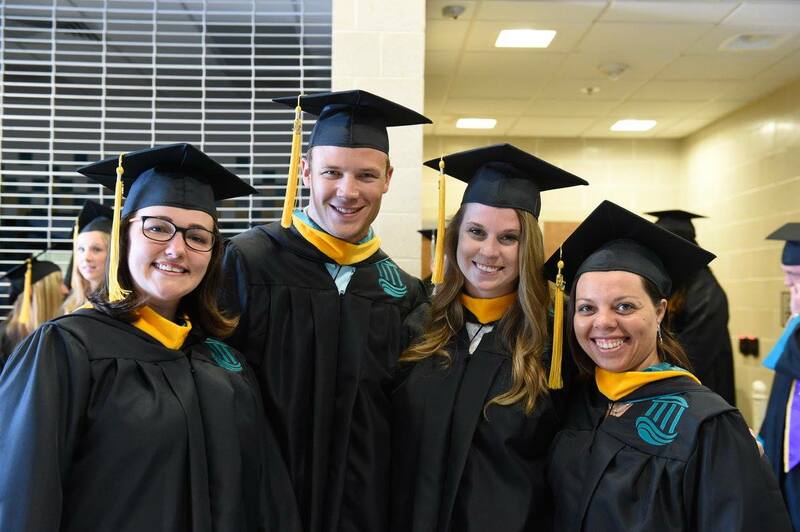 Read more about Congrats to our Spring 2016 Graduates! Out of seventy-five undergraduate student research presentations, two students mentored by SCMSS Faculty Erin Hackett and Roi Gurka placed within the top three under the poster and oral presentation categories. According to some authors, metazoan species that inhabit the sediment-covered deep sea have ranges on the 100-km scale; others suggest that ranges are on the 1000-km scale. This ambiguity needs to be resolved because it makes it difficult for deep-sea ecologists to generalize their results and for policy makers to make good decisions about activities such as fishing and mining. At least part of the problem arises because most authors have used morphology alone to assess species’ ranges, but this approach does not separate closely related species reliably. As a way forward, we used both morphological and genetic data to investigate the ranges of harpacticoid copepod species; we chose harpacticoids because they appear to be poor dispersers and thus constitute a conservative test case. Our material came from the continental rise along the west coast of the United States. We used morphology to combine individuals into nominal species. We then obtained gene-sequence data from the nuclear 18S ribosomal RNA gene and the mitochondrial cytochrome oxidase b gene from every individual in each nominal species. We considered individuals to belong to the same species when the morphological and genetic data agreed. We found 7 of 34 species (21%) to have 1000-km-scale ranges. Thus, many harpacticoid species in the deep sea have ranges much larger than 100 km, and we predict that deep-sea species that are better dispersers will have an even greater proportion of species with 1000-km-scale ranges. Our results also raise the question of how some harpacticoid species maintain genetic continuity over 1000-km-scale distances in the deep sea. 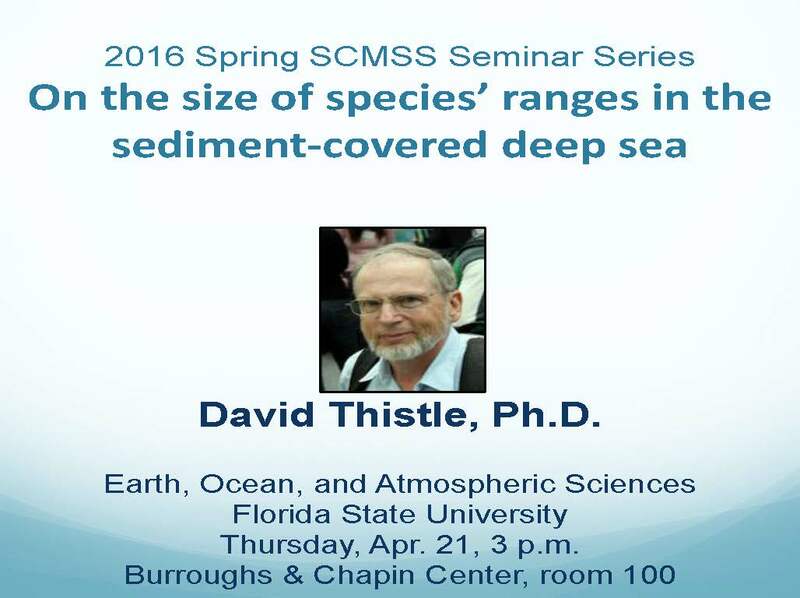 Dr. David Thistle is a Professor Emeritus in Biological Oceanography at Florida State University in the Earth, Ocean, and Atmospheric Science department. Sands cover half of the world’s shallow well-lit ocean and underlie some of the most productive marine ecosystems. They have been called nature’s bioreactors filtering particulates from a substantial portion of the world’s shallow seas every day. Despite their preponderance and productivity they have not been well studied in the past, because of misinterpretation of early observations and the poor applicability of older methodologies. However, in the past 20 years we have made substantial progress in beginning to understand their biogeochemical function. During my talk, I will provide a historical overview of our evolving understanding, focusing on the coasts and the inner continental shelf, and touching upon minimally intrusive field observations, targeted sampling, and validated modeling. 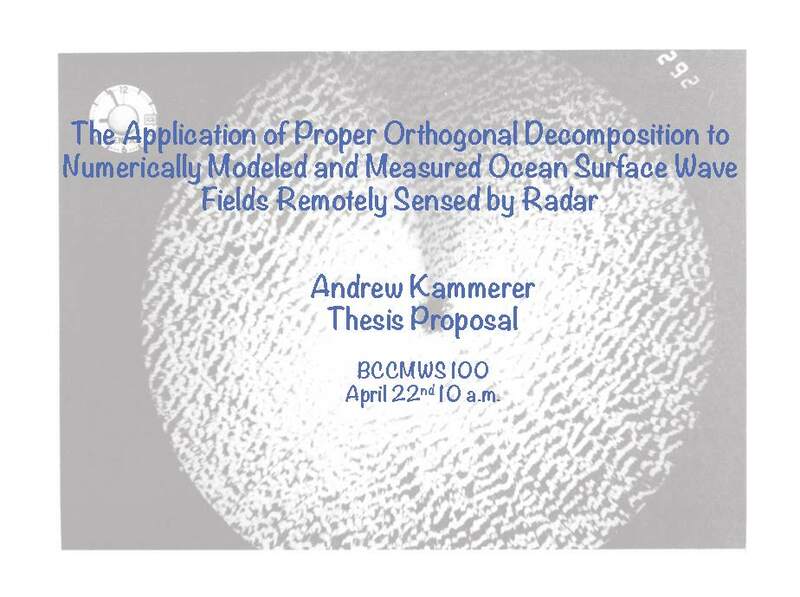 I will demonstrate the various ways in which the interplay between sand permeability, physical exposure to waves, currents and tides, their interaction with seafloor features, such as ripples, and sand grain types and characteristics result in a high diversity of microenvironments that may affect the oceans and, indeed, the atmosphere. Finally, throughout my talk I hope to provide a perspective on the future of the scientific study of this extensive habitat and how it may benefit society. 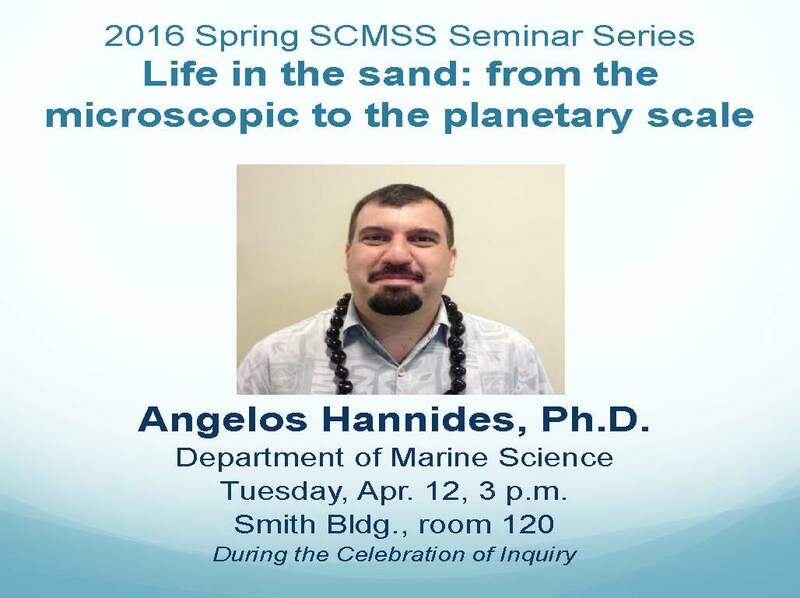 Dr. Angelos Hannides is an Assistant Professor in Marine Chemistry at Coastal Carolina University in the Department of Marine Science. He received his Ph.D. in Oceanography from the University of Hawaii in 2008. Associate Professor Till J.J. Hanebuth recently embarked on a research expedition to Bangladesh. Joining him were ten colleagues from eight universities in total, including tectonic specialists, hydrologists and archeologists from Germany and Bangladesh. The geographic focus of this trip was the outer Ganges-Brahmaputra Delta, an area consisting of a large contiguous block of protected mangrove forest (a UNESCO heritage site referred to as the Sundarbans), where the research team was attempting to quantify the historic subsidence rates along the coast, i.e.